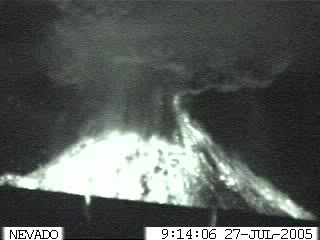 Image captured from the webcam at Colima volcano, showing the powerful explosion on the early morning of 27 July. Colima's Volcano of Fire had a spectacular, predawn explosion Wednesday 27 of July, shooting incandescent rock, ash and steam nearly 9,000 feet into the air over western Mexico. The eruption sent ash raining down on nearby communities, but officials had no reports of major damage.